We are in the technology era. With the internet, we have an unlimited supply of information available to us with literally a click of a button. This has helped us in many ways like being able to create a more competitive market for producers thus lowering prices for us, the consumers. However, it also creates an environment of almost too much information. It is hard to know what to trust as well, with the constant conflicting information and sponsored ads. We even see ads engrained in our social media outlets and even in some of the people we follow. Because we do not always get to see the little “#ad”, it’s not always easy to know what information is good and what information is fake. Typically if we are looking for a new face cream it is easy to return it if it does not work or at the very least find something else, it isn’t a big loss but when it comes to safety we can’t be so casual about it. A child’s safety isn’t something that we can trial-and-error with. When new parents are shopping for car seats they want to know that their child is safe and secure at all times without fear that the product they purchased is a dud. In this article, we have looked at the best car seats from the best car seat brands of 2018. We first looked at the brands themselves, reading into their reliability, reputation, and experience, then from there, we found their top car seat. Each of these car seats are not only the (current) best of the brand but they are also consumer-rated and reviewed. We reviewed the likes and dislikes of each and created a review based on those comments. Though they all have their cons safety is never one of them. Rest assured that with these car seats your child will be safe, comfortable and secure so that you can focus on the road. Now that we have covered why car seats are required and what type of car seats are required (for different weight and heights), let’s review the top car seats on the market. These seats range in price, function, and type. All of the companies we have selected are reputable companies with good customer service teams. All of these companies and products have high consumer reviews. We also found the top 3 we found to be the best for price, quality, and ratings (listed above). They are also all tested to be safe and reliable seats for children when installed correctly and used within the proper weight range of the child. Let’s get into it. This car seat is beautiful in design, only coming in one color (black). It can hold children ranging from 22 pounds to 110 pounds, so not meant for babies under 2. It has a reclining feature as well as the backless booster option. It is easy to install and has a five-point harness and high-seat back. If you find yourself with a squirmy child leg space may be a must. This car seat is comfortable for the child and also gives plenty of leg room to move around a little more freely without losing the security needed to keep the child in place. 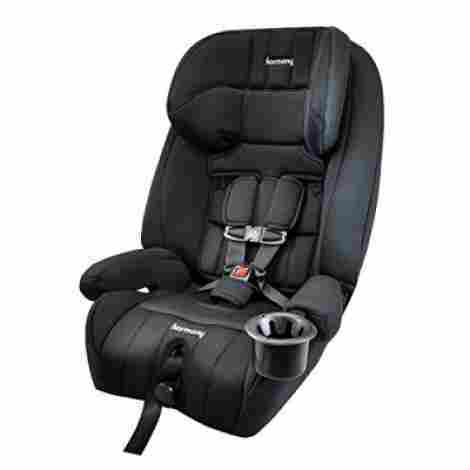 This car seat is quite attractive in appearance and is made of high quality material. The child will not only have ample room (again, without affecting the security of the child) while also being comfortable. This car seat is quite inexpensive. It does not have a ton of bells and whistles but is an attractive looking seat, is very safe and is comfort for growing children. All in all, a really great buy. This car seat is an all-in-one convertible car seat. It comes with a booster (with a high back), the booster back can be removed to be a no-back booster seat and also is a forward-facing child car seat. The forward-facing seat option can hold babies from 4 to 40 pounds in weight and the booster ranges between 110 and 120-pound max depending on whether the back is on or off. It also comes in four different colors. This car seat can comfortably fit a 100-pound child until they are 100 pounds, at that point the back can be taken off and used backless for an additional 10 pounds. As with the Diono, this car seat is fully customizable for all sorts of changes in environment and child. It has a 10-point position adjustable headrest, a six-point position recliner option and a rear-facing and front-facing option. This car seat sits in the middle range in price. It can hold anything from 4-pound child to a 120-pound child. It is a 3-in-1 and convenient for multiple children and multiple vehicles. It's also lightweight for easy transfer between vehicles. This car seat has a foam, absorbant liner for the childs safety and comfort. It is inexpensive and comes in two colors. It includes cup holders and can hold a child up to 110 pounds. This car seat is not meant for babies or smaller toddlers (should be used with children over 22 pounds). This car seat in inexpensive for parents on budgets but still made of quality materials. The lack of bulk at the bottom of this car seat allows the child to sit lower to the seat making it easier to socialize with others sitting in the same seat. It is also tall for taller children. 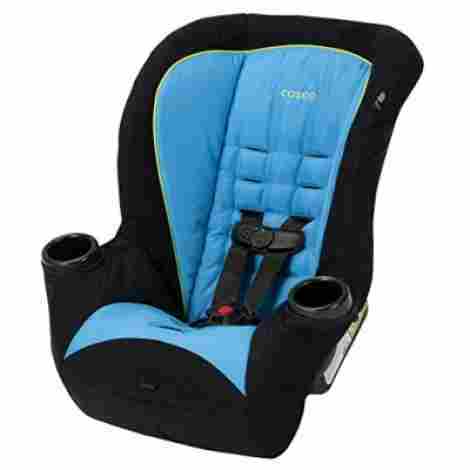 This car seat is very inexpensive, sitting at the lowest end in price. This is great for parents with budgetary constraints or taller children. This car seat can hold up to a 120 pound child, similar to the Britax car seat. It actually has memory foam seats for the most comfortable expereince for your child. The harness is energy absorbing and is made of very durable material. It comes in 6 different colors and is modern in design. As mentioned above this car seat that are made of memory foam to not only add comfort for the child but also act as shock absorbers. It is made with premium, soft fabrics that add comfort and life to this car seat. This car seat somehow was a twelve-point adjustable headrest, five-point shoulder positions and three-point buckle positions making it ideal for all sizes of children (great for when used with numerous children) and different vehicle types. This car seat sits in the middle in price range. The car seat is attractive in appearance and is great for different sizes of children. This is great when there are a couple kids in the family and more than one family car. This car seat is intended for older children being able to hold up to a 120 pound child (so quite large). It comes in five colors and easily straps into both small and large vehicles. This car seat is more of a booster in that it is meant for older and larger children, and that it uses the seat belt as a bottle for the child. It does include an additional harness though for total safety of the child. This car seat/booster holds higher than average weight (120 pounds max). This is good for growing or heavier children that need extra support. This car seat has two layers of fome lined body decreasing the impact in car accidents or quick stops for the safety of the child (preventing whiplash). It is also deep so the sides of the body help protect against side impacts. This car seat is mid-range in price. The price is in the safety features of this seat. 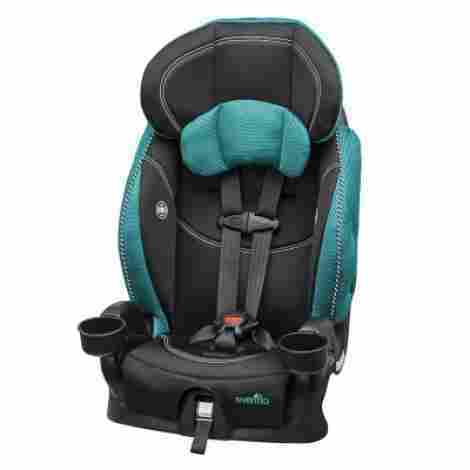 With the harness included as well as the added security from the seat belt, as well as the side and back impact resistant body this seat is all about safety. This carrier is incredibly light-weight, comes in seven different colors and is simple in design. It is made of the best fabric and has extra padding to ensure that the child is comfortable. It also comes with a sun canopy which is unique to most car seats. It will hold up to a 30 pound child sitting at about 32 inches in height. This stroller is not only made of premium fabric but also uses a wicking fabric that draws liquid away from the child and helps deodorize. This is good for accident prone children. The fabric is also machine washable. This would be ideal for longer car rides like road-trips. 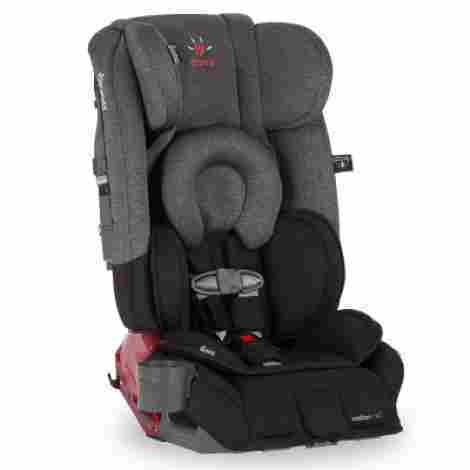 This carrier/car seat very comfortable for children and supportive of their necks. This car seat is in the middle in price range. It is not cheap but it is not expensive either. The price is justified by saved irritation of a crying baby, with this car seat and how comfortable the child will be in it. Overall a nice middle ground for people on a budget looking for something that will do the job, keep the child comfortable and dry. This is a sleek looking stroller. 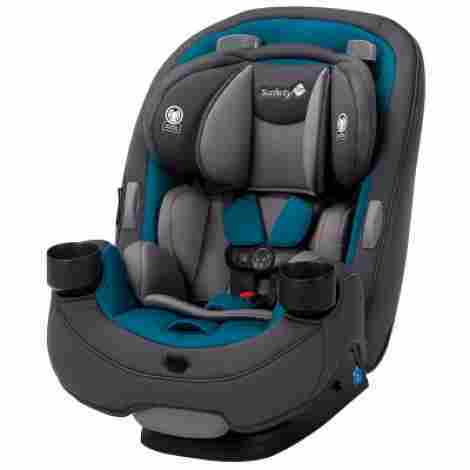 Another car seat and latch base car seat, this car seat comes in three colors and can support a child up to 35 pounds. It also doubles as a booster seat for growing children. Due to the integrated wheels the Doona is a rear-facing car seat only. This is the first of its kind, with wheels installed at the base of the car seat allowing the seat to go from stationary to on the go in a very short period of time. It comes with a base that stays in the vehicle that easily attaches to the rear-facing car seat with minimal adjustments. When the car seat is loaded onto the base within the vehicle the handlebar of the carrier/car seat adjusts slightly to angle towards the seats stopping any rebound if in a collision. The Doona car seat is quite expensive. We think it's worth the cost with its features. The innovation of the wheels included in the unit eliminates the need for a stroller. It's also ideal for parents that are on the go. The ease of use of this car seat and how versatile it is makes it worth the cost. Additionally, it is a very fashionable looking stroller with minimalist features. This car seat looks like something you would strap into to fly to outter space! It comes in nine colors and has the ability to adjust the back rest for the child. 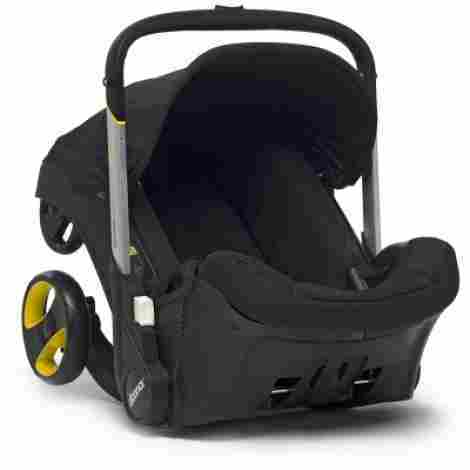 It also holds up to 100 pounds which is considerably higher than many competative car seats on the market. This car seat will last you a very long time, being able to convert into eitehr a rear-facing, forward-facing or a booster for children of all size and ages. Unlike with most car seats this car seat can actually recline into three different positions which helps the child feel comfortable (even when sleeping) as well to ensure it fits in different types of vehicles. This car seat is fairly inexpensive considering it's specifications and additional features. Because this can work for children 5 pounds to 100 pounds it will last for a good deal of the childs life. With the booster ability, as well, it completely eliminates the need to buy a booster later in life. This is a top choice for budget restraints and for quality. This is a minimalist looking car seat with two cute cupholders. It can be used either rear-facing or front-facing depending on the parents preference. It comes in 3 colors and can hold a baby up to 40 pounds in weight. This car seat may be simple but it has the ability to be either front-facing or rear-facing, making it better for a larger age and weight range. Additionally, allowing the parent to keep the child rear-facing if they feel it safer for longer. This car seat is very inexpensive. If on a budget this car seat sits on the lower end in price considering other car seats on the market. There is nothing to really consider here, the car seat is inexpnesive and highly rated. There were not much complains as far as quality goes of this car seat. You are paying for the limited features of this seat. If the intent is to only use a car seat as a car seat then this car seat is for you. This car seat comes in 4 different colors and can be converted into a stroller with an additional purchase of carriage add-on. It includes a new-born head/body support system that is also removable for when the child no longer requires it. It is 27.5 inches deep and 24 inches high. It isn't always easy to tell if car seats are in the correct position so this car seat comes with level (bubble) indicators that allows the parent to see if the seat is installed correctly. Because most car seats don't usually transform into a stroller too most don't come with a canopy. The canopy on this car seat helps protect the baby from sun damage and overheating. This car seat is on the expensive side as it doubles as a stroller and thus has a lot of the same features that a stroller has. It is multi-purpose and saves from having to buy numerous travel accessories for a child. For busy parents this car seat does a lot of the work for you and also limits the number of travel systems required to get around, it's worth the price because of the convenience. Looking at the structural integrity and the shock-absorption abilities are the primary and probably the paramount criteria for a car seat. In a crash we want to ensure that the car seat stays together and also ensure that the child feels as little impact as possible. The shock absorption of the seat will help avoid whiplash and the structural integrity will ensure that the child doesn’t fall out of the seat if the worst happens. This leads us into material. We want to make sure that the seat is made of materials that can handle wear and tear, do not easily rip, are comfortable for the child and are easily cleanable. The fabric used should have wicking abilities as well as deodorizing ones. The material should also be able to come off the seat relatively easily so that it can be washed and the material should be machine washable. The child will get squirmy if not comfortable in their chair so any padding under the fabric should be durable enough to withstand shock but double as comfort for the child. Memory foam has proven to do both. The reputation of the company is incredibly important because a company with several recalls or shoddy products may end up selling the buyer an unsafe product. Reading reviews is extremely helpful. Be weary of one-off’s but if you are seeing more and more complaints about unsafe products another company should be considered. Additionally, because car seats have expiry dates, buying with small companies may land you with an already dated model due to less turn-over. We aren’t discouraging you from buying from small businesses but just make sure the model you are using is the most recent model to ensure that you aren’t needing to buy more frequently. Safety ratings are fairly obvious but car seats should meet the safety standards in your province. The regulation behind these products are provincial or territorial so we have to ensure that the models we are buying and reviewing are models and brands approved by our province/territory/state. Looping back up to the fabric and padding, the child’s comfort is considered. An uncomfortable child is a squirmy child. And a squirmy child could be a driving distraction. Additionally, no parent wants their child to be in an uncomfortable seat. Ensuring the fabric is soft and doesn’t cause a reaction, as well as proper padding and sizing will ensure that the child is comfortable and happy, and hopefully even sleeping, on the drive. No parent wants to cheap out on their kids safety, that said paying a high price only because it’s considered invaluable isn’t ok. It’s important the price doesn’t exceed the features and the product. We reviewed car seats all within a decent price range in order to help those on a budget and those who want the bells and whistles. We also found some nice middle ground. Price should be something to consider, as typically you get what you pay for, but you shouldn’t be paying extreme amounts of money to keep your child safe. Q: What car seat do I need for my child? A: It depends on numerous factors including age, weight, and height. Babies need to be in rear-facing car seats that they can lay back in as their neck muscles cannot support their head very well yet. Children above 20 pounds can sit in a front-facing car seat. Children over 40 pounds can typically sit in booster seats as long as the seat belt or harness goes over their shoulders and the bottom of the seat belt goes around their pelvis. Q: Are there laws associated with what type of seat is required for my child? A: Yes, depending on the country. A lot of countries in Europe require rear-facing seat belts for much longer than in Canada and the United States, some countries do not allow front-facing car seats at all. Canada allows a front-facing car seat at 1 year of age and a minimum weight of 22 pounds, while in the US it is a 20-pound minimum weight limit. It’s wise to look at your countries legislation to determine what the laws are in your area. Q: Can car seats sit in the front seat? A: A car seat should never sit in an area that has an airbag. Though airbags are meant for the safety of adults, they can suffocate babies. In some countries, it’s actually illegal to drive with a child in the front seat. Again, research on your own country is wise to determine if it is legal or not. Q: Do car seats expire? A: Yes they do. The expiry date will be listed on the manufacturer’s label, usually located on the side or base of the car seat. They typically expire after 6 years. They expire because materials deteriorate over time, there are also different rules that go into place depending on the government and in general, the seat is no longer safe when older. It’s important to consider this when buying second hand or buying a car seat from a smaller company that does not sell as many of them (and therefore have older stock). Q: How tight should the child car seat straps be? A: We have an article on this. For a more thorough explanation click on the link but in general it should fit snug all around and the child should not be able to move more than an inch in all directions. Q: How do I stop my child from attempting to get out of the car seat? A: We have an excellent article about this as well. Q: Will a car seat help prevent motion sickness? A: We also have an article on this too! Q: How do you put a child in a car seat? A: It depends on the model but typically there are shoulder straps that should be snug (but not cutting into) the child’s shoulders. Shoulder straps usually come with shoulder pads to ensure that the shoulder pads are on the right side of the strap before moving onto the next step (pads should be on the inside against the child’s shoulders). Next is to ensure that the buckle is between the child’s legs (they are pretty mobile so it’s easy to forget about it and end up with the child sitting on it), the buckle should go through the legs and rest somewhere near the child’s belly button. From there you will want to snap the shoulder straps into the buckle on either side. There is also usually a link that sits on one side of the shoulder straps that will connect the two shoulder straps- connect the shoulder straps together and give the harness a little tug to ensure that it is buckled in completely and to ensure that the baby can’t move too much. Some strap/buckles are a little different, it’s wise to check the instruction manual included in with your harness to make sure that the proper procedure is being followed. Q: Can I skip the booster seat stage? A: You can however it really isn’t wise. There are a couple car seats in this article that are all-in-one options. If you don’t want to have to buy another car seat these may be better options for you. The booster can only be skipped if the car seat was big enough to hold a child until they were about 4’11” and then skipping a booster may be an option but this isn’t likely. Q: How do you install a car seat into a car? A: This also depends on the type of car seat, there are different variations. Typically the seatbelt is used to secure the seat into the vehicle however, this would be something to consult the instruction manual on. Because this is so important we encourage you to read it thoroughly. This will be the critical process in keeping your child safe when in scary situations (like accidents or quick stops). Q: What are the groupings on car seats? A: There are three groups- group 1, group 2 and group 3. Group one is a seat in a vehicle that holds the child in place with a five-point strap system. This recommended for children between nine months and four years. Group 2 is recommended for children four to six years old and the seats are adult seats with regular factory straps already installed in the car. Group three is a booster seat and these are intended to lift the child up in order for them to be able to utilize the factory car seats safely. These are the technical groups of car seats. In conclusion, child safety is something that all parents take very seriously. It’s important that the car seat being used is snug to the child without pinching as well as tight to the seat. Most car seats have five-point harnesses but there are some on the market that have even more for specifically fidgety children. Shoulder-pads are important for these types of children too as movement can lead to rubbing, and without proper padding, this could ultimately hurt the child’s skin. It’s also important that the car seat that is being used is made of good materials can withstand collisions while being comfortable for the child. Some have moisture wicking which can be helpful for accident prone children both in that it keeps the child dry as well as helps deodorize and others are made of memory foam that helps both with the comfort of the child as well as help with shock absorption. Having a strong car seat body structure is important in keeping the child safe in an accident and a headrest is essential for smaller children with weaker necks. Price is always something to consider considering they can vastly change in price range however safety should never be put behind cost. Finally, the style of the car seat- there are some very stylish and technologically advanced models on the market that are both attractive to look at and add whole new levels of conveniences for new and busy parents. We hope that this article helped narrow down your choices for quality car seats. Happy travels!